The best hair transplant doctor knows that all hair follicles are not alike. If you think about it, that makes sense. Not all hair is alike. Curly hair, wavy hair and straight hair have follicles that work to create these kinds of hair. The best hair transplant doctor will always take these differences into account. Straight hair comes from a straight, round follicle. Wavy hair comes from a follicle that is slightly curved and indented on one side. Curly hair comes from a highly curved follicle that is oval in shape. The best hair transplant doctor plans a procedure that makes sure the result will look natural by placing hair follicles the proper distance from each other and at the right orientation. Straight hair follicles must be placed close together to get a natural look. 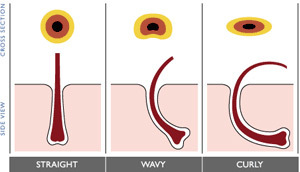 Wavy hair follicles are farther apart, while curly hair follicles are even farther apart. The important thing to know is that the best hair transplant doctor will take dozens of factors into consideration when it comes to crafting the right hair transplant design that is right for your particular scalp. Make sure that any hair transplant doctor you are considering takes the time to explain the type of hair you have, how that relates to the transplant plan, how many follicles will be transplanted and what you can expect to see when your transplant is done and your hair is fully grown (at about one year). Next PostNext The best hair transplant? It may not be a hair transplant at all.